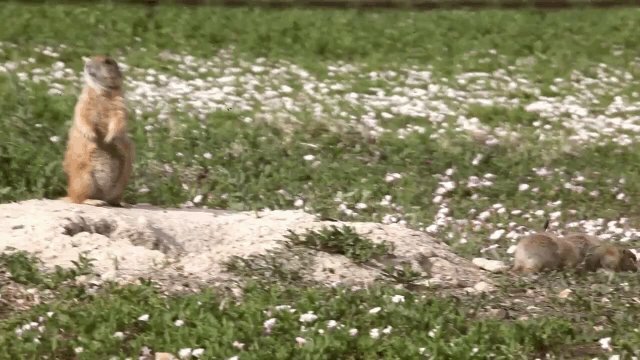 Prairie dogs are very talkative creatures, but one peculiar noise has remained a mystery to scientists -- until now. Sometimes, with no danger in sight and seemingly nothing in particular to communicate, a prairie dog will suddenly jump up on its hind legs and issue a noise that sounds like "wee-oo!" Immediately after this, all other prairie dogs in the vicinity will do the same. It's been termed the "jump-yip" or the "prairie dog wave," but it remained a puzzle. A new study from the University of Manitoba discovered that the more prairie dogs in the jump-yip, the longer the originator of the call would spend looking for food. They theorize that the call is actually a test to see how many other prairie dogs are around and on alert. The more protection the first prairie dog has, the longer he has to look for food. Almost like the prairie dog version of counting how many people you have to feed before buying groceries. Amazing!